Retirement is a big step in life. This guide will help you get information and make informed decisions about your retirement. Please select the topic below to get more information. There are different types of retirement that you may qualify for depending on your age and the years and months of service credit you have in your retirement system account. Ordinary Disability and Accidental Disability Retirement are available to certain members who are totally and permanently disabled from performing their normal or any assigned job duties. The eligibility requirements and benefits for disability retirements are very different from other types of retirement. The PFRS, SPRS, and JRS allow for a continued pension benefit to a survivor. PERS and TPAF members can choose from a number of different "Pension Options" that allow you to leave a life-time survivor benefit to a beneficiary after your death. JRS members also have these additional options. Retirement estimates show how much your retirement benefit will be. The estimate can also include the amount for a survivor benefit after your death, your group life insurance benefit after retirement, and other important information about your retirement benefits. Call your Human Resources Office for retirement estimates. Call (609) 292-0909 for retirement estimates. Retirement seminars and webinars take a step-by-step approach to the retirement process and what happens after you submit your application. Trained counselors explain your benefits, beneficiary options, group life insurance, loan repayments, pension income taxes, and health benefits coverage in retirement. Seminars usually conclude with a question and answer period. Register for retirement seminars and webinars. Seminars/webinars are not available for SPRS members. Seminars/webinars are not available for JRS members. Your pension benefit is based partly on the amount of service credit posted to your retirement system account, so purchasing additional service credit — if you are eligible — may increase your pension amount or let you retire sooner. For most retirees, the group life insurance benefit becomes much smaller when you retire. You have the option to convert the smaller amount to an individual policy — without the need for a medical exam. Some retirees will qualify for health coverage under the State Health Benefits Program (SHBP) or the School Employees’ Health Benefits Program (SEHBP) when they retire. For retirees who meet service credit or other requirements, the State or employer pays some or all of the cost of the SHBP/SEHBP coverage. Retirees who do not qualify for State-paid or employer-paid coverage may still be eligible for coverage, but have to pay the full cost. Pension checks are subject to federal income tax (except for Accidental Disability Retirement). However, if you paid tax on any of your contributions to the retirement system, that portion of your monthly check is not taxable. 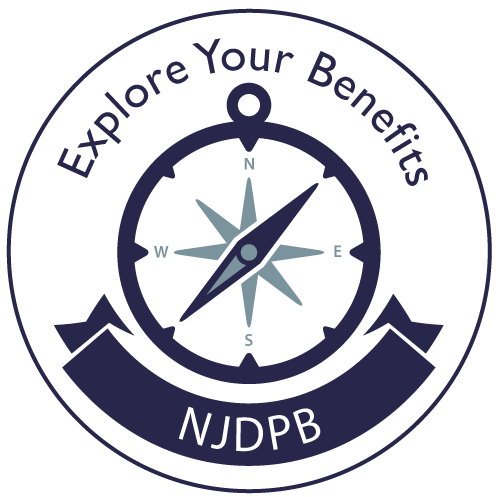 If you live in New Jersey, your retirement benefit is not subject to New Jersey State income tax until you get back through pension checks the same amount you paid into the pension system while working. If you live outside of New Jersey, check with your home state's tax office to find out if your pension is taxable in the state you live. Court orders - Qualified Domestic Relation Orders (QDRO) granting alimony for divorce/civil union dissolution, child support, or equitable distribution. Working for private industry, the federal government, or a government agency in another state will not normally affect your retirement benefits. However, returning to public employment in New Jersey after retirement may jeopardize your retirement benefits. Retirees should be very careful before accepting any public employment jobs in New Jersey after retirement.